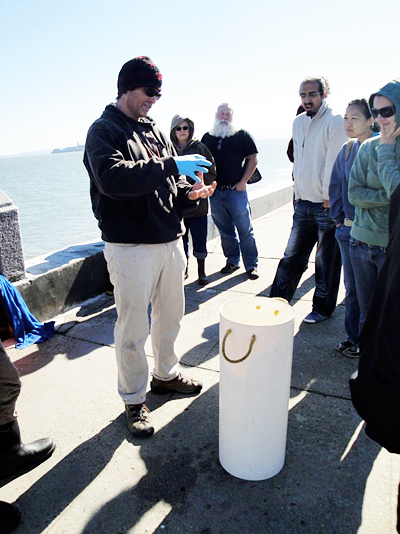 Kirk Lombard demonstrates the cast at his Saturday morning Coastal Fishing/Foraging Tour. On the Saturday morning that I gathered with 20 some other people near the lighthouse on Yacht Road in the Marina neighborhood of San Francisco. He warned us early on that the Advil he had taken that morning might wear off at any moment. The previous week he had repeatedly buried fish hooks into his hands, and then, when deep diving into mudflat after horse neck clams, he had infected the wounds. 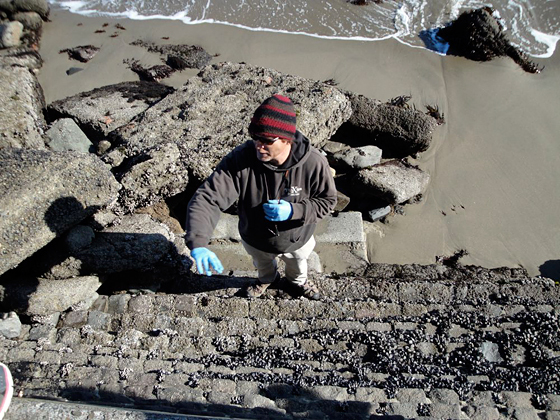 Kirk Lombard shows students how they could survive a catastrophe by foraging seawalls. But he powered through the pain and showed people edible limpets that “taste like abalone” and warned them that they “must be willing to risk their lives for them, as they were gathered where waves crashed.” He baited up a crab snare with squid and showed how to fish for them—only red crabs are keepers in the bay, but like most fishermen, he wasn’t going to reveal his prime fishing spots, only his wisdom on how to catch the critters. 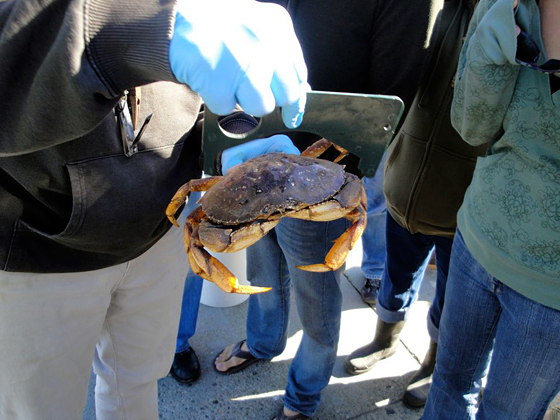 A Dungeness crab that is legal size-wise, but you can’t keep these crabs if they are caught in the bay. While demonstrating casting for crab and telling anecdotes and natural history of the regions waterways that needed a bit of fact checking—like there are so many sea lions because there are no natural predators in the area. Um, great white sharks? But fishermen are known for their spirit of rugged adventure, and Lombard has this in spades. Kirk explains how you want to remove a horseneck clam from the mud in “all its phallic glory” as he put it. He is the only fisherman commercially harvesting monkeyface eel, which is labor intensive and not lucrative. He claims it, “keeps me in beer money,” as well, very few fishermen go after red crabs in the bay, as he does, because they “will break you fingers with their claws and admittedly, there’s not a huge market.” He also takes nets out and fishes for surf smelt with a hand tossed net and night smelt with an A-frame based on Native American fishing methods. 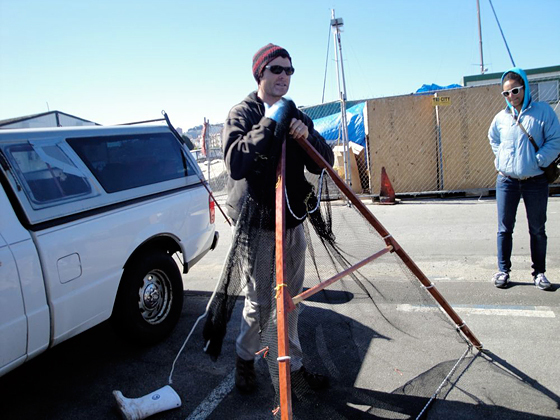 Kirk shows the A-Frame fishing net he uses to catch smelt. 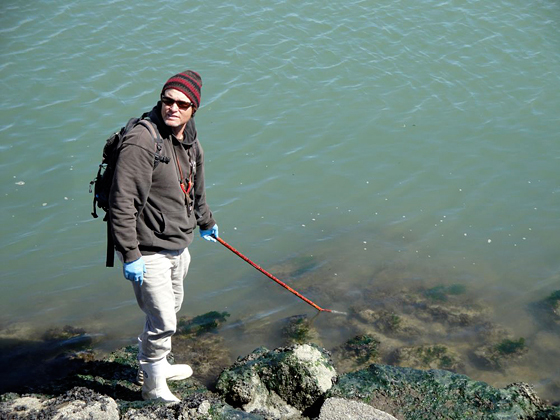 He has yet to be granted a commercial fishing license for using his hand tossed net for herring fishing, and hopes to soon as he is helping to bring back these underappreciated forage fish to restaurants in San Francisco. Developing our tastes for these fish would also be a boon to sustainability. 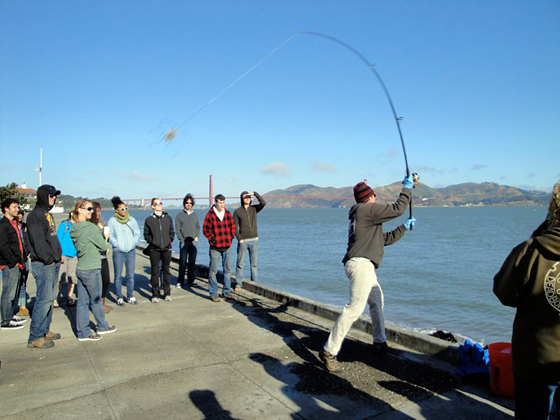 Small or forage fish in Northern California include squid, anchovies, smelt, sardines and herring. Herring is the last commercial fishery in the San Francisco Bay, and these fish are used exclusively for their roe, which is shipped to Japan. The bodies are used as bait or sold to fishmeal companies. While the fisheries in California are managed, reports are coming out from other regions in the world that these small fish, which are a critical part of the ocean’s food chain are being wiped out. These fish are primarily being made into fishmeal. The tour culminates with an exciting demonstration poke poling for monkeyface eels. According to the Lenfest Forage Fish Task Force report that was published this year, 90 percent of forage fish are used for agriculture, fish farms and nutritional supplements. According to their report, in 2006, 88.5 were made into fish oil and 68.2 percent of fishmeal was used by the aquaculture industry, i.e., salmon farms. When feeding farmed salmon, 3 to 10 pounds of these small forage fish are needed for every one pound of farmed salmon that’s produced. So instead of eating farmed salmon, we would all be better off if we ate these little fish. More and more, innovative chefs in the San Francisco Bay area are serving up forage fish and adventurous diners are in for a treat. Poggio in Sausalito is serving bruschetta with marinated sardines and a pea and mint puree on bread cooked over coals. As well, they are serving calamari over squid ink pasta. Bar Tartine in San Francisco has herring escabeche on the menu. Comal in Berkeley has a chilled calamari salad with marinated butter beans, roasted pasilla peppers and zucchini. 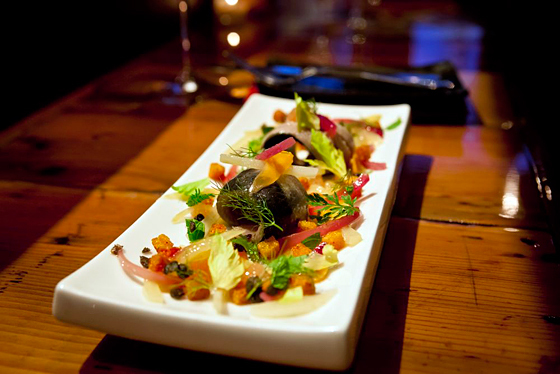 Bouche in San Francisco is serving sardines with grapefruit, mint and marinated vegetables.